Your assistant is fed up with being ordered to jump into boxes...so she gets her own back. She forces the magician to stand againgst a walled platform and proceeds to tie ropes around him until he is trapped against the board there can be no escape. Two curtains are now pulled to engulf the magician. The audience watch the assistant step into the curtained enclosure......only to see the magician appear 1 second later on the other side. The magician now parts the curtains to find the assistant is now tied to the board..what a sneaky fellow. This the improved version on the old classic. A much lighter and slicker performance than the originaland alot lighter and compact to transport. Full Workshop Plans. 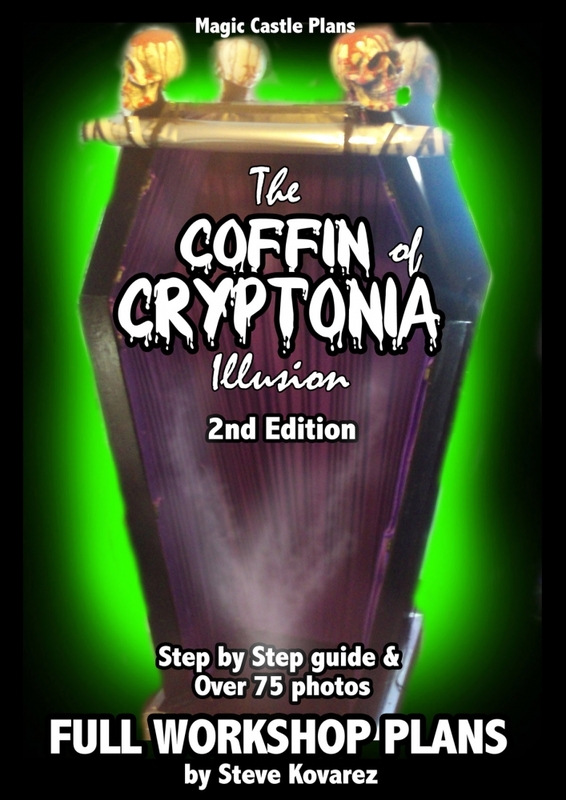 An up right coffin on a thin base is seen upon the stage with a clear crystal front panel. 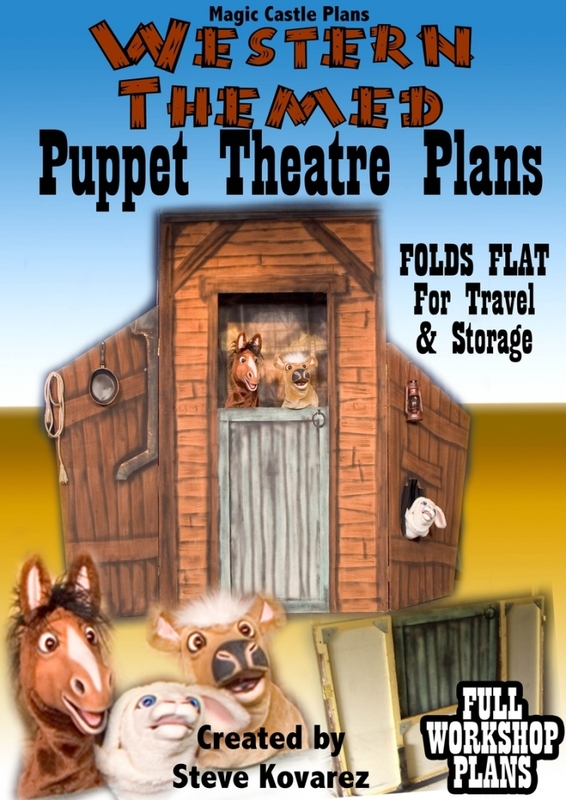 A complete 12 page set of workshop plans on how to easily construct this great puppet theatre which also doubles up as a nice piece of scenery. Contains lots of photos and diagrams and material lists etc Perfect for school shows and projects, amateur dramatic, childrens entertainers etc. 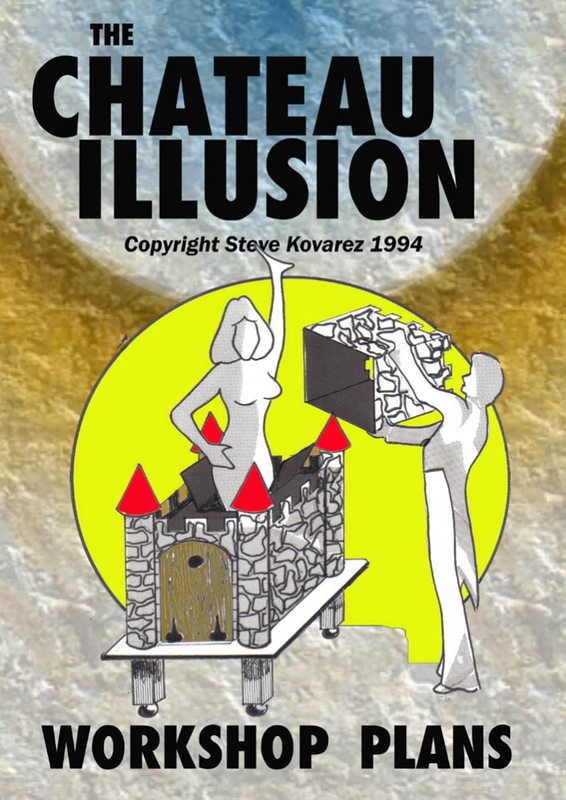 A chateau castle upon a table is shown all around, and the drawbridge is lowered to allow the audience a complete view of the inside of the chateau. The top tower is also displayed to be empty. A doll resembling a princess is placed into the chateau and the drawbridge is closed. A cloth is thrown over the top of the tower, where slowly the form of a girl grows under the cloth emerging from the top tower. The magician whisks away the cloth to reveal the beautiful Princess, now life size standing within the chateau walls. The top tower is then removed and the Princess is assisted out to thunderous applause. 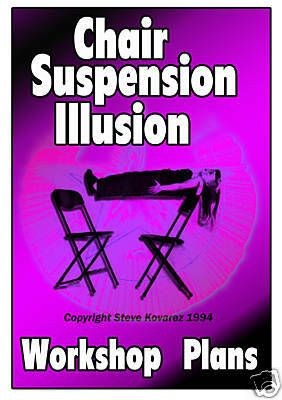 A Great cabaret illusion that packs small and plays big and can be performed surrounded. As the curtains open, an unusually shaped tall cabinet is seen on stage. Two stage assistants enter and spin the cabinet around to show all sides. The Assistants then open the front door which hinges down to allow the audience a clear view inside the open topped cabinet. The front door is closed and the whole unit is once again spun for one last view around the structure. The assistants then un-attach and open every panel which unfolds to reveal the magician standing within the centre ready to start his show. The cabinet is made from fabric covered panels and sits on a 1” thick table which is raised from the floor allowing a clear view through and around the box which is performed in the middle of the stage. An impressive appearance. A low octagon shaped table is shown. It is one inch thick and has a black canvas tube laying upon it. The audience can see over, around and under the table which is revolved to show all sides also proving the absence of mirrors....it is just a one inch thick table. The table has a 7ft tall pole that rises from it and bends over the table with four bars protruding from it. Now the magicians assistant is introduced who stands upon the table. The magician now ties and binds her hands together then ties her to the top of the pole framework. He now raises the cloth tube up around her which he gathers up around the ropes that bind her wrists. The gathered tube is now suspended from 4 rings that hang from the protruding bars atop the framework. He now shows a nasty looking sword which he stabs into the cloth tube.....a scream is heard from within. The magician now grabs the cloth tube which is release from the framework and falls down onto the table......THE GIRL HAS GONE ! She’s vanished completely! All that’s left is the cloth laying on the table with the sword and the ropes still hang from the bar. The audience can still see under, over and around the table...The girl has Octa-gone ! 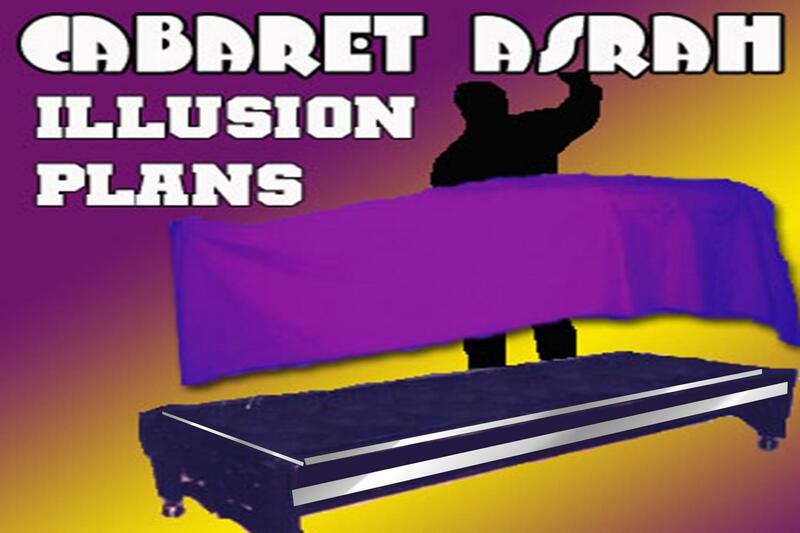 A great Cabaret illusion that packs down small and plays big and can be performed surrounded. The magician shows a wheeled base with several folded pieces of framework upon it. He opens the two side pieces and locks them into place. The final piece folds out to be a 6ft high canvas covered easel. A rod is slid between the frame and the sides thus propping the frame up at an angled position. The whole unit is spun to show just the empty framework. The magician now grabs a can of spray paint and begins to spray a picture on the canvas. The audience can slowly see that he drawing a picture of a girl. Another can is introduced and he sprays on a different colour for her dress. The whole unit is now revolved again – still an empty framework. The magician takes a marker pen out of his pocket and draws on a face. As soon as this is done he removes the support rod and the whole canvas crashed backwards as your assistant suddenly bursts through the canvas and out of the picture to thunderous applause. 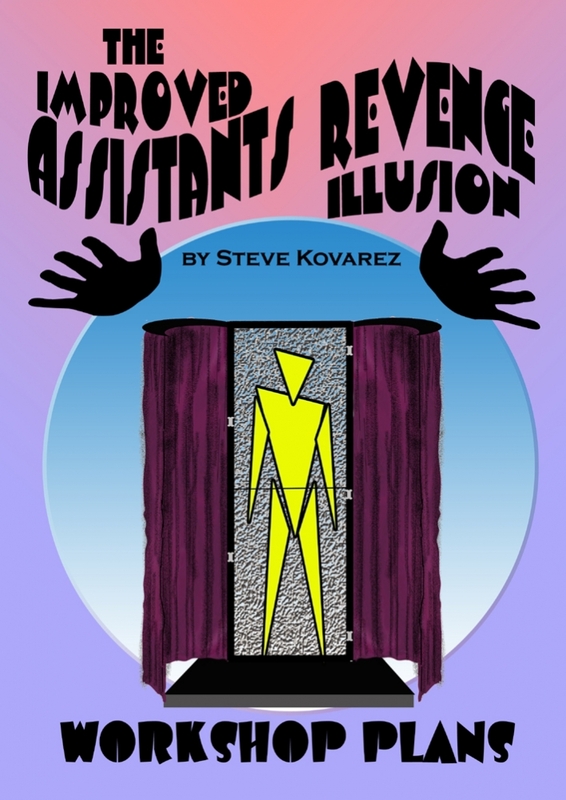 A great cabaret Illusion thats packs down small and plays big - perform virtually surrounded. On stage is seen a large 3ft square mirror within its own frame and standing upon its own trestle legs on top of a wheeled base. The magician taps the mirror and spins it showing the rear..It is a normal mirror. He now invites a member of the audience to come up on stage and inspect it on behalf of the audience. There are no trapdoors and secret panels to be found..It really is just a normal mirror. They also inspect two black Lycra panels which will also be used in the illusion. The audience member is thanked and re-seated. The magician explains that in just a moment he will walk right through the centre of the mirror. To illustrate the target area he places a black lycra target in the centre of the mirror where he will pass through. The rest of the mirror is clearly seen on either side of the black target. The magician now spins the mirror and shows the rear and places another target on the back of the mirror which is solid wood. The magician explains that not only is going to have to melt through the mirror but also the wood backing. The mirror is now returned to the front position. Two roller blind are now swung out from the locations on top of the frame and lowered on either side to protect the magician’s secrets from the side (if working in cabaret conditions – not needed for theatre). The magician now stands behind the mirror.....suddenly his hand is seen pressing into the front lycra target panel....the audience can still clearly see the mirror either side of the panel. The magician thrusts his head and body through the entire mirror...IMPOSSIBLE....after emerging from the mirror completely he shows the mirror through the lycra split in the target.....The mirror is now spun round to show a solid back after the target has been removed. The mirror is again spun to the front and the front target is removed to once again show the solid mirror with no holes or joins. A large colourful open topped box is shown and spun around to show all sides. 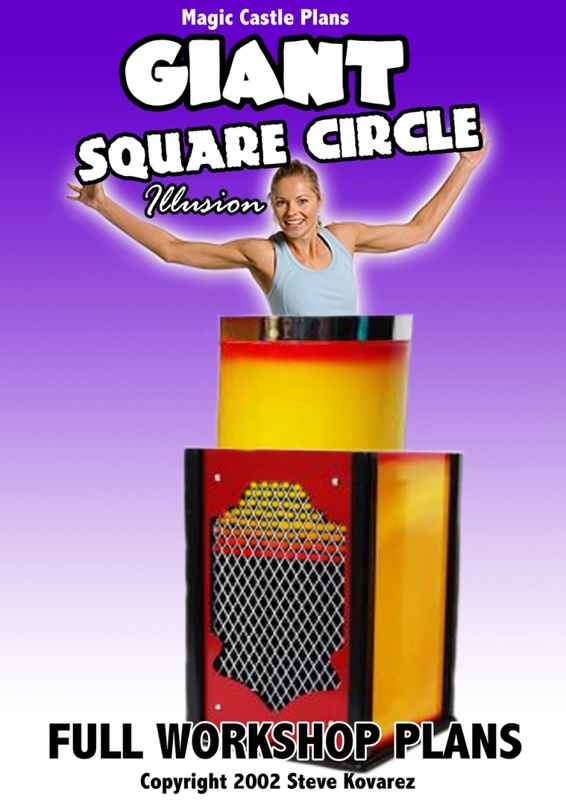 The box has an open mesh front through which can be seen a colourful tube inside. The outer square tube is lifted and shown empty. Now the inner round tube is lifted and also shown empty. While the inner tube is shown, a clear view inside the outer box can be seen through the mesh to be empty. The round inner tube is now replaced inside the outer box. At the magicians command his assistant suddenly appears inside the inner tube. All tubes are now lifted thus releasing the girl to help with the rest of the magicians act. 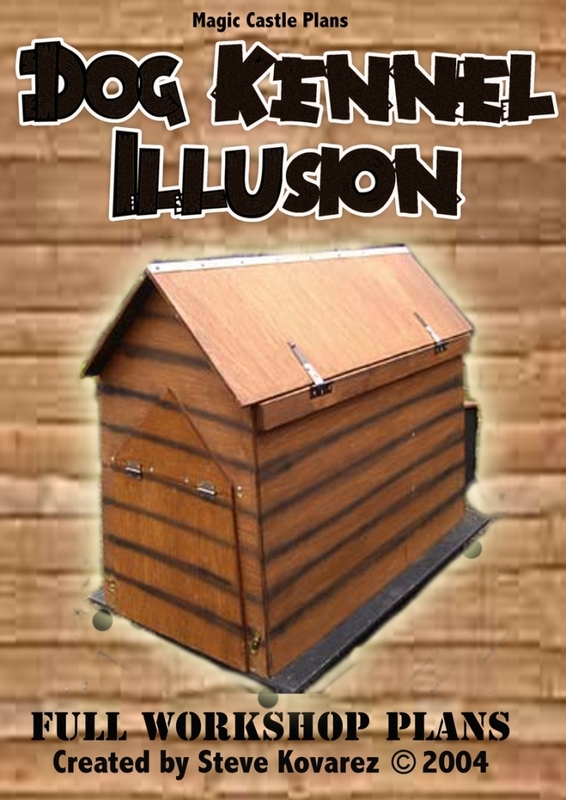 A very simple and economic illusion to build and very easy to perform and store. 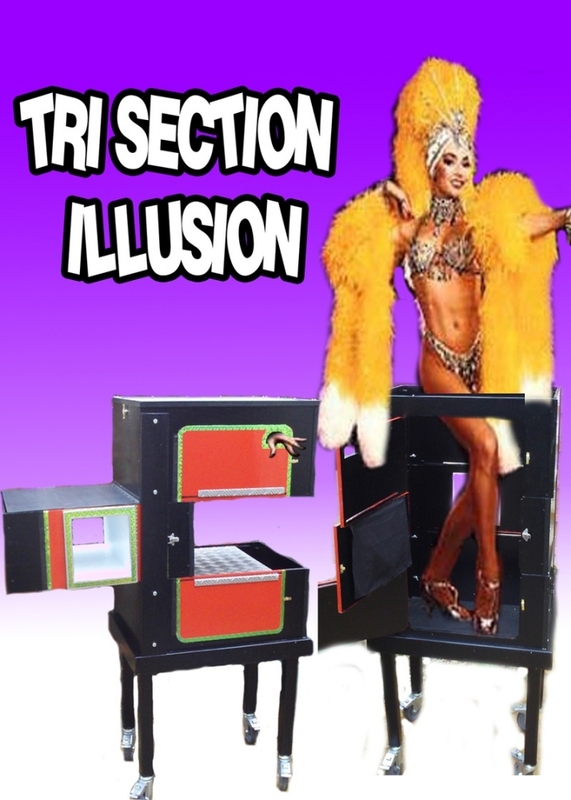 A simple yet great cabaret illusion that packs small and plays big and performed surrounded. 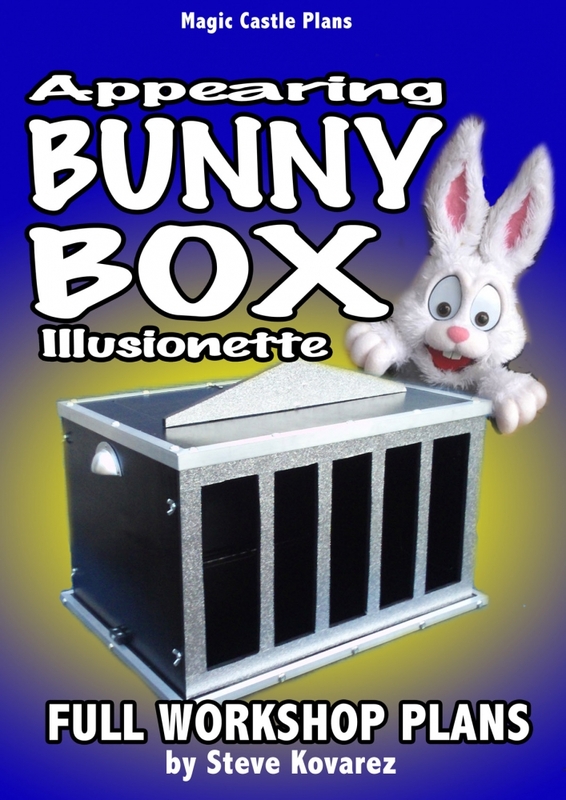 A children’s magician comes to the end of his show and announces that he brought a special guest with him – A rabbit called “Flash”. He asks the boys and girls if they would like to see him, they all shout yes. The magician brings forward a cage covered with a cloth. The magician explains that “Flash” is asleep in the cage and that they need to shout wakey wakey because he’s asleep. The children all shout wakey wakey and the magician removes the cloth....but horror of horrors...Flash is not in the cage. All that’s left is his favourite scarf which the magician removes from the empty cage. The magician explains that he’s a magic homing rabbit and if all the children shout “FLASH FLASH FLASH” he will appear. They all shout and the magician flicks the scarf in front of the cage and quick as a flash...the rabbit appears. The lid is removed and the children all gather round to give flash a stroke. F) If you do work with an assistant this is something that they could perform while the magician is off stage changing costumes by either the assistant talking the audience through it or with a voice over on your sound track. Completely Self working and easy to perform. The magician wheels on stage an old looking costume trunk and spins it around. He then tips it over onto its side and opens the lid showing a completely empty interior. He closes the lid and tips it back onto its base. He shows a dancers costume which he places inside the trunk. He then closes the trunk and spins it again. He opens the lid again to reveal his beautiful assistant wearing the costume. She steps out of the trunk ready to begin the show. An easy, and comfortable way of making your assistant appear. Very easy to build and it packs flat for transport! You show a small cabinet on wheels and open the front doors. Your assistant is placed into the cabinet which is only just big enough to house her. Two blades are inserted through the cabinet dividing it into three. Her hand can be seen thru a hand hole in the top corner. The whole middle section is then pulled to one side. A tube is then inserted into the middle section..surely the girl cannot still be alive? Yet her hand still wiggles. The whole unit is then spun and the whole process is then reversed and your assistant is released completely unharmed. Full workshop plans. 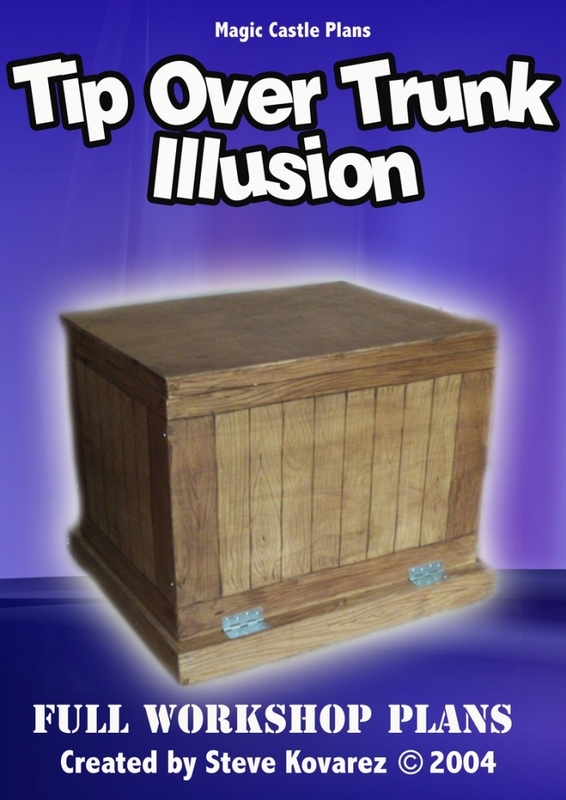 Magician shows a large box sitting upon a thin table and revolves it. It has a front and back door and a lid. The magician assistant now has a red hanky tied to one of her wrists. He removes the lid of the box and his assistant climbs in. The lid is replaced. The magician now shows 8 nasty looking swords. He thrusts four of them in very quickly through slits in the side. The girls hand now appears through a small hole in the front panel wearing the silk around her wrist...she appears to be still alive so the magician now thrusts the last 4 swords into the box her hand still waving through the front. He taps her hand and she withdraws it into box. As soon as her hand is inside the magician removes the front panel virtually instantly to reveal that the girl has now vanished leaving only a box full of swords....on one of which is now hanging the silk from the girls wrist only seconds ago. The back door is also removed so the audience has a clear view through the whole cabinet....the girl has vanished without a trace. The doors are replaced and the swords removed. The lid is lifted as the girl reappears. She jumps out and both magician and assistant take their applause. On stage ihe magician makes his entrance. He draws the audiences’ attention to a scrolled up piece of paper seen sticking out of the goblet on top of the pole. He explains that it is a prediction he had earlier and wrote down.....and there untouched and unreachable it will stay and can be there throughout the show. The magician randomly selects a young lady from the audience. This can done by throwing a rose or soft ball into the audience and selecting the lady that catches it or is closest to it. 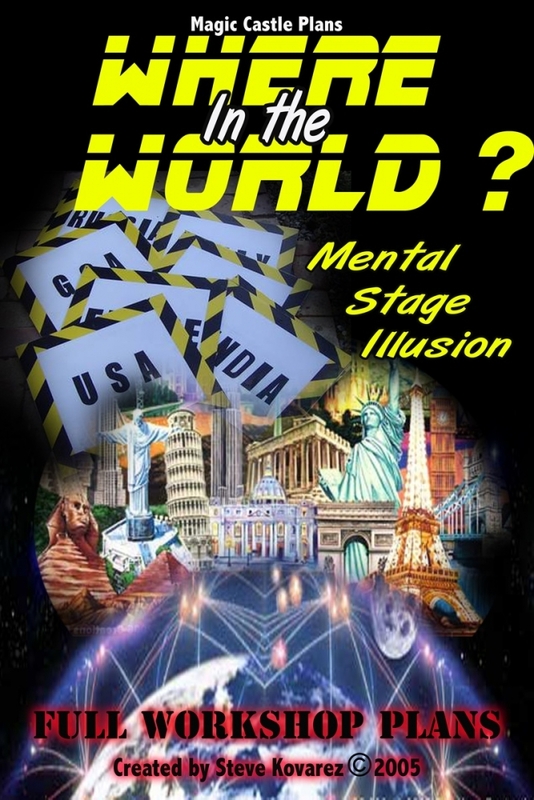 The young lady is invited on stage where the magician points out that he has b=never seen the lady before and nothing has been set up or prearranged. 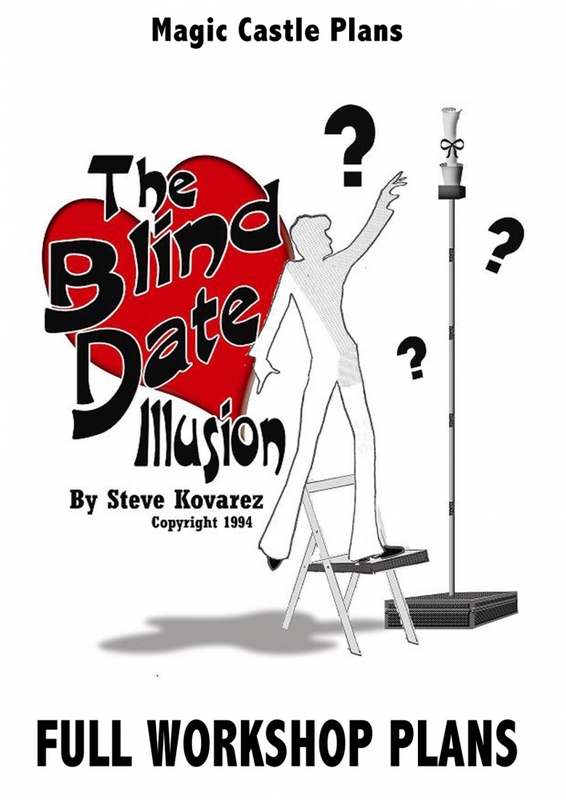 The magician asks her name and tells her to imagine her perfect date. He asks where in the world she would like to go, what they are doing i.e. cinema, restaurant etc, also what month it is, what the lady is wearing and the address that they kissed goodnight at. The magician now asks his assistant for a chair which he uses to climb up to reach the prediction inside the goblet. He plucks the rolled up piece of paper from the holder and invites the lady or someone else from the audience to open the prediction and read it aloud. It matches perfectly with the answers that the lady gave only moments before. The magician now gives the young lady the rose, which she caught earlier and the prediction to keep as a memento of her magical experience. The audience goes crazy and mutters to themselves....”how the hell did he did that!” Remember ...No Stooges, No nail writing, Packs small Plays big can be multi themed. 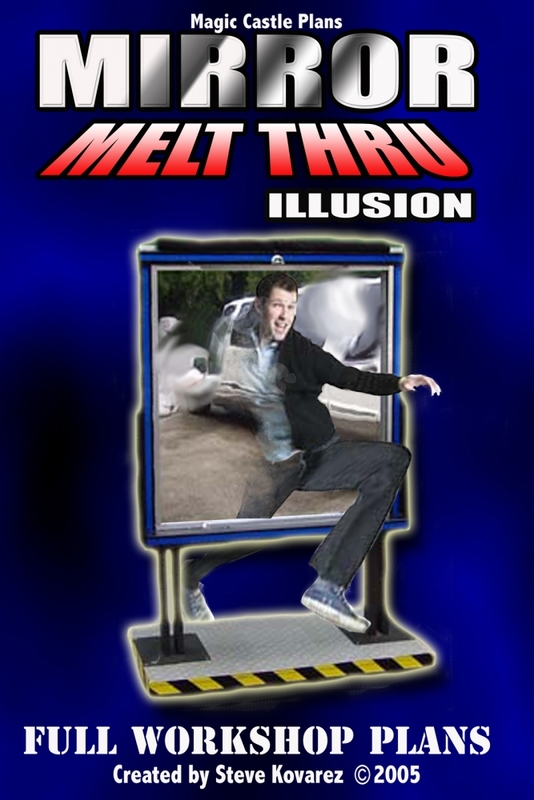 This is one of magic’s most flamboyant and spectacular illusions. 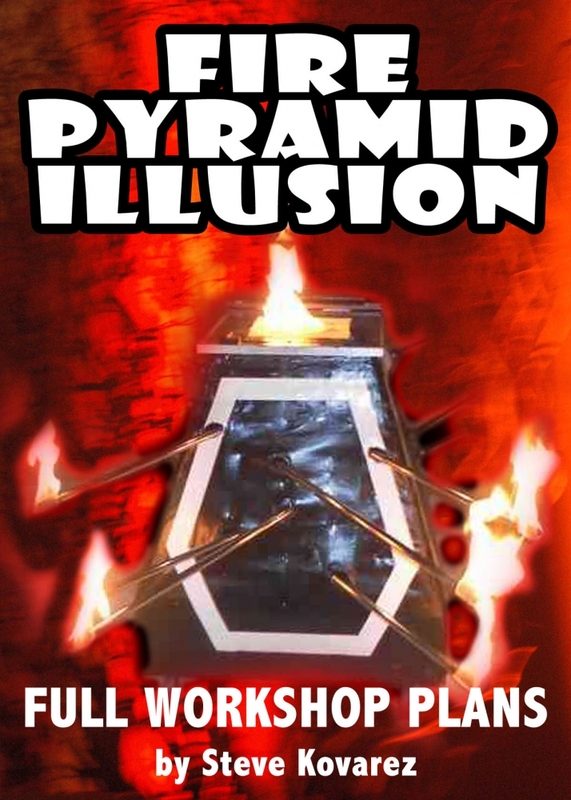 The magician shows a small black pyramid and spins it to show all sides. His lovely assistant now enters and is handcuffed and chained. The top of the pyramid is opened and the magician lifts her in.....it is barely large enough to contain her. The lid is closed and locked...there is no escape. The magician now lights a candle and leaves this on top of the pyramid......I feel a sacrifice coming on! He now reveals 6 long chrome spears which he touches to the lit candle.....the ends burst in to flames. As the music increases tempo he begins to thrust each of the poles into pyramid which is covered with small holes. The girls screams can be heard as she is turned into a human kebab. When all six spears have been inserted through the box in every conceivable angle the candle on top of the pyramid is removed and the lid opened. The magician touch the top of the open lid and it too bursts into flames.....surely the girl cannot survive this inferno. The lid is closed and the spears are removed and extinguished. The lid is opened to reveal girl having escaped her bonds with not even a single burn to her body.....the audience goes wild. Effect 1: A Gothic style archway is seen on wheeled base. It has sides but no front or back. The magician and his assistant enter dressed in robes. 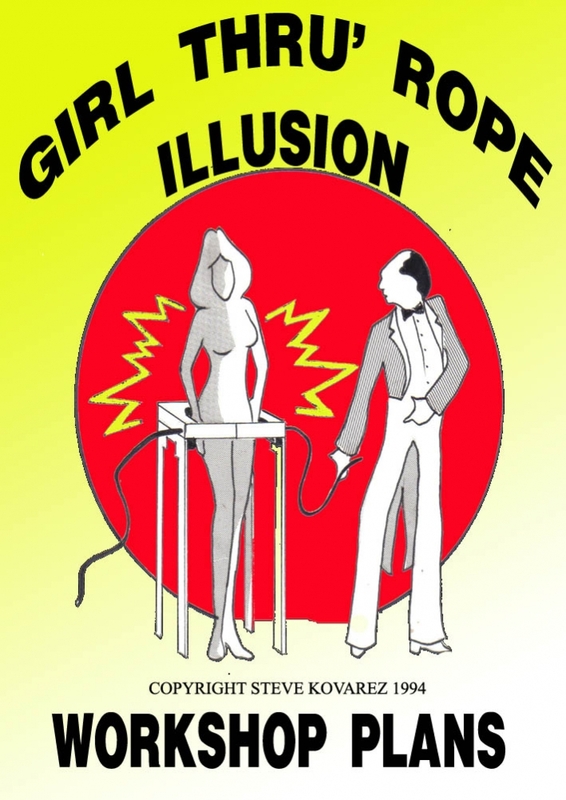 The girl stands in the archway while the magician ties her hands and feet to each side. The magician then raises a cloth in front of the girl and secures it. As the stage lights are lowered he then picks up a medieval style flame torch from a stand and walks around the back of the arch, the girls shadow can be seen on the front sheet – the torch is left behind the arch on a stand. The magician then emerges from behind. He picks up a sword and thrusts into a slot in the sheet and right into the girls stomach – a scream is heard. The magician immediately grabs the centre of the cloth and pulls it away to reveal that the girl has vanished without a trace. Effect 2: This is basically the same effect as above but with the twist that after the sword is thrust into the girls stomach and the cloth pulled away to reveal that she has vanished, the magician removes his hood only to reveal that it is now the girl and it is the magician who has vanished. The archway can then be covered again and the whole unit revolved to show the magician now standing inside. Effect: A small thin table is seen on stage with a stool beneath it and a small box atop of the table. The magician introduces his assistant to take a seat on the stool. The girls head sits within the small open fronted box on top of the table. The magician closes the front door on the box and inserts a sharp blade across the box’s bottom – thus severing the girls head and then stabs a sword through the side of the head box impaling her head. Yet the girl doesn’t scream. The box is now slid from its central position on the table to the far end of the table, proving that the girl really has lost her head. The whole effect is now reversed and your assistant now stands up without a scratch to thunderous applause. The magician brings on stage an old trunk on a wheeled base. He explains that it once belonged to an old showgirl who kept her costumes inside it. He opens up the trunks lid and lowers the trunks front panel to reveal 3 drawers inside the trunk. He explains that these three drawers contain the showgirls various costumes. The drawers are removed and the contents of each are shown. Various feather boas and skimpy outfits are shown and replaced. The drawers are replaced. The magician displays one last costume and says that the red dress is his favourite. This is placed in the top drawer and the lid closed. 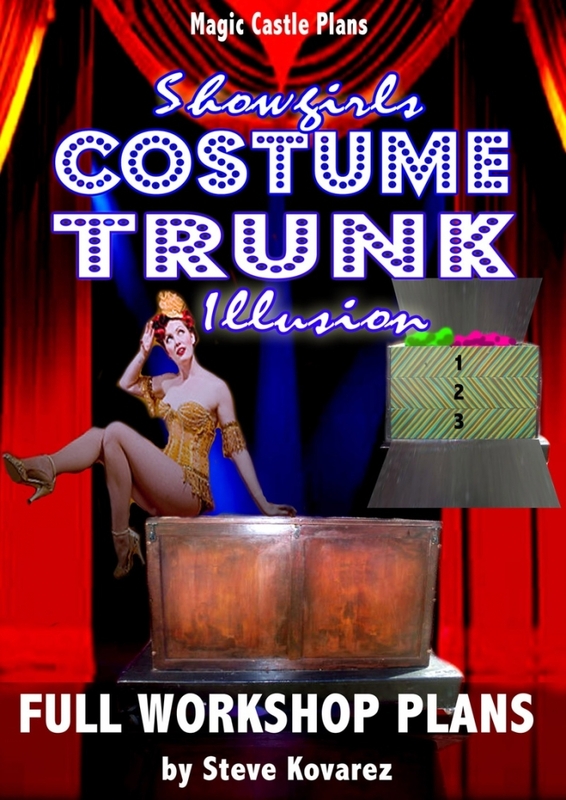 The trunk is quickly spun around when suddenly the lid bursts open and there standing inside the trunk is the showgirl wearing the very same red dress. As an alternative routine each outfit could have a number label and a member of the audience could choose an alternative label with the same numbers to freely select an outfit, and voila the showgirl appears in the selected outfit. 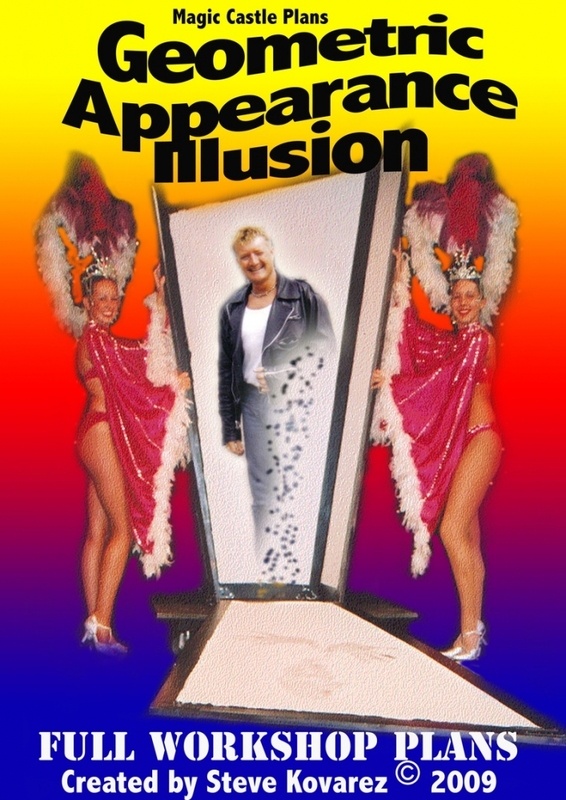 A great appearance illusion that can be performed surrounded. On stage is seen a small dog kennel on wheels. The kennel is spun around to show all sides. There is a small bone house on the back. The front door is flipped open to show the audience a completely empty interior. The magician now brings out a small dog and opens the front door again is places the dog inside the kennel and locks the door. He now spins the kennel to show the bone store at the rear from which he removes a bone and then dismantles showing that that too is now empty. The kennel is once again spun to the front. The magician now whistles and knocks on the front door with the bone. Suddenly the roof bursts open and your assistant dressed in a skimpy dog costume is seen standing in the kennel who seems too large to have been hiding in there. This is an amazing piece of transformation magic and one that packs down extremely small, with only a few pin hinges. A Small temple type cabinet is shown and the front panels are removed. Your assistant now entersand sits within the cabinet with her hands and legs outside of the cabinet which are enstocked by the front panels of the cabinet. The magician now thrusts 7 long blades through the cabinet and his assistant. Now two swords are also thrust into the roof and into the girls head. Surely she cant still be alive - yet her hands and legs still move ! The magician removes the blades and swords and the front panels showing the girl still sitting and unharmed. The magician shows the audience a large cardboard box to the audience which has been folded flat. He opens it out and folds in the bottoms tabs forming the box. His assistant now jumps inside wearing a gold dress. The box seems hardly large enough to hold her. The magician forces her in and closes the top side tabs thus sealing the assistant inside the box. 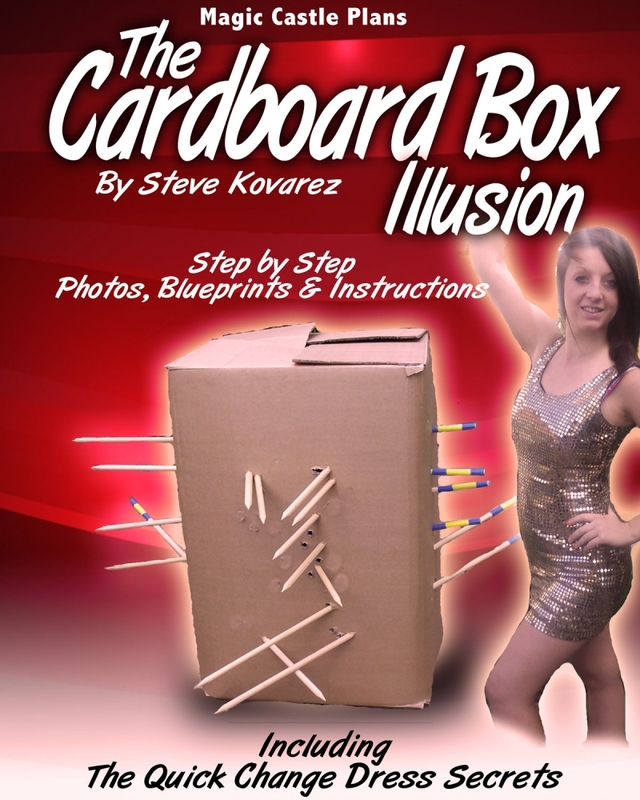 The magician now shows 15 long and sharp dowelling spears which he now proceeds to thrust through the box at random around the box impaling it and the girl inside no doubt. There are no trapdoors here or false bases. The sword are rapidly removed and a gold silk scarf the same colour as the girls dress is thrown in the air...it flys towards and into the box where the girl suddenly emerges in a change of costume in a red dress completely unharmed and no worse the wear for her multi stabbing ordeal ! The perfect illusion....packs very flat, weighs nothing and will fit in your suitcase. 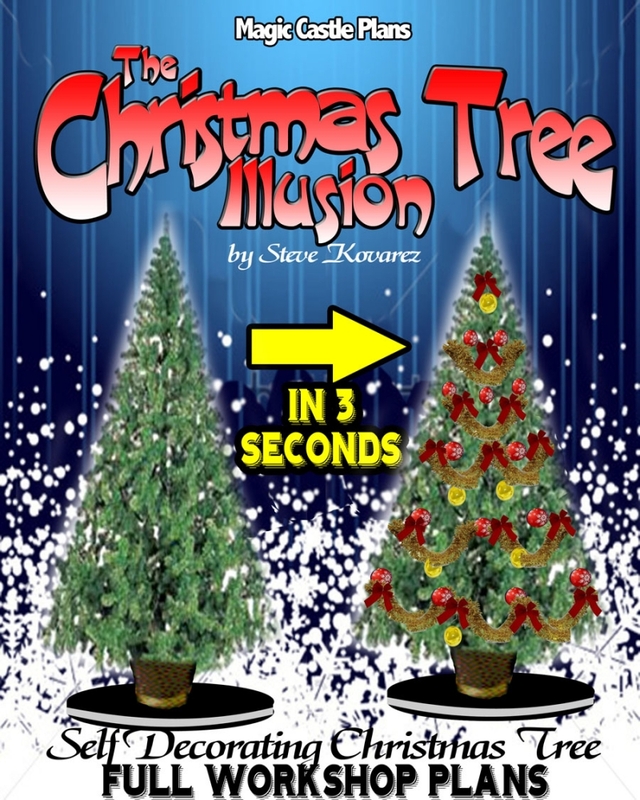 Effect: On stage is seen a 6 foot high Christmas tree completely bare. A cloth lays in front of it. The magician grabs the cloth and raises it covering the tree from view - 3 seconds later he lowers the cloth to reveal that the tree is now decorated with tinsel,baubles and bows. 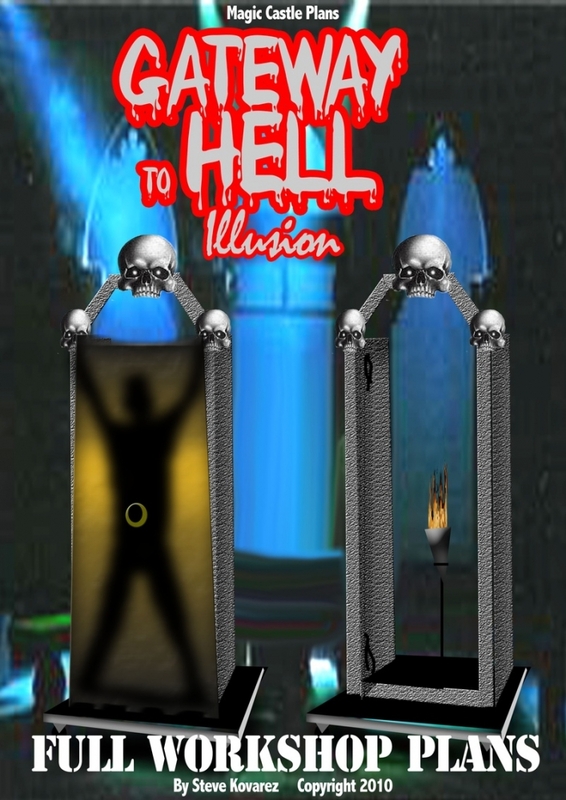 A great stage illusion - suitable for theatre shows. Some rock and roll music starts up and your assistant enters wearing a 50’s style poodle skirt. The magician now brings on an upright cabinet on wheels and spins it around showing all four sides. Inside the open base is a box which he removes and places on top of the cabinet. He opens the front doors and shows an empty black interior. The magician now beckons his assistant who is doing the twist to come over and enter the cabinet. She squeezes inside the cabinet and the small top box is lifted up as the girls head gets in placed and is lowered down onto her head with only her face showing through the front opening. A metal blade is inserted into the bottom of the cabinet to restrain her movements around her waist and the front doors are now closed. The top small box which contains the girls head is now slowly revolved around and around and each time the front spins into view the girls face can be seen spinning around with the box.....surely she can withstand her neck being twisted a full 360 degrees several times? 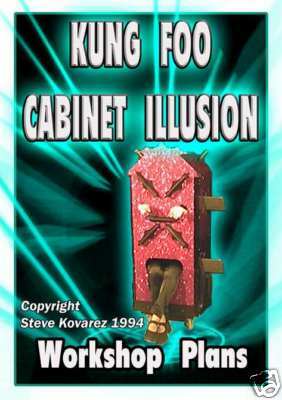 The magician now opens the front doors of the main cabinet to reveal the girls body is now completely twisted up inside which looks extremely funny. The audience can still see her legs out of the bottom of the cabinet and her head out of the top and the girls hands can be seen sticking out of her twisted body. The whole process is now reversed and the doors opened releasing the girl back to normality. 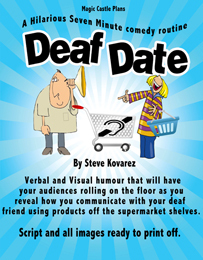 From the imaginative mind of Steve Kovarez comes a brand new and clever comedy routine called "Deaf Date"
You can only imagine the conversation about Rosemary meeting Aunt Bessie and Jack Daniels and having a Hobnob, but only if you'll Lettuce ! 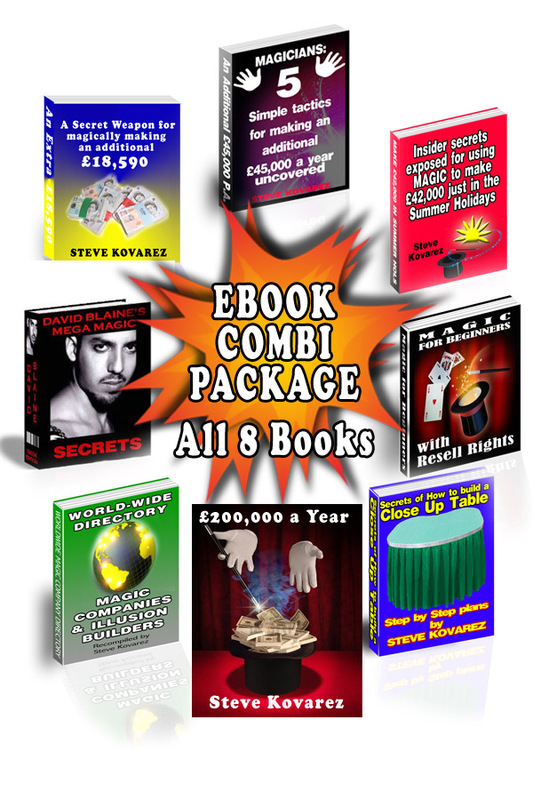 Comes complete within in two files: A) The Script & advice B) The routines images ready for printing. Overseas users: Although mainly based on products found within the UK. The majority are equally as well known around the world and the script and images are easily changed to items found within your own countries supermarkets should you wish to change any part of the routine to make it fit your countries terminology /products....or can be used as a "on my trip to England" style presentation. Comes complete with all the product images within the second file ready for you to print out and get started straight away. No need to be naturally funny for this routine which takes care of that for you. Maybe performed by hearing and deaf entertainers alike and should not cause any offence to either group. "What a Genius and funny routine - This is going straight into my act! " A hilarious effect similar to the paper balls over head routine, where the audience are in on the secret from the beginning but your volunteer isn't. A very funny 4/5 minute comedy mind reading routine with a shock ending that the volunteer doesnt see coming. 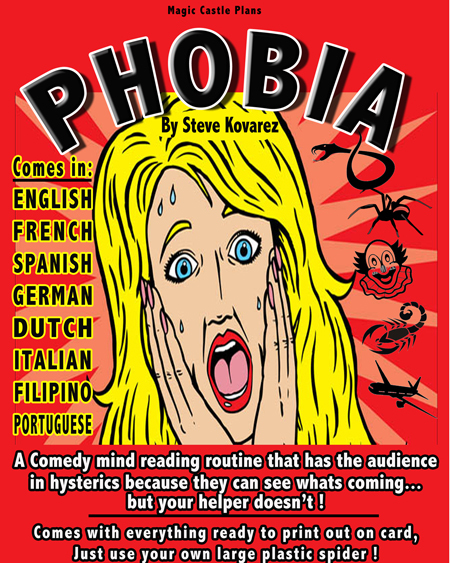 All based upon the types of Phobias. Easy to do - no skill needed and is self working allowing you to concentrate on the presentation. Comes complete with image grid ready to print out on card. Just add your own joke spider...easily found from joke shops. Can be used for Close up routine, Childrens shows or Adult Cabarets. Image grid prop is designed in 8 languages: English, French, German, Spanish, Portuguese, Italian, Dutch & Filipino and a plain copy for any other language. The magician invites his assistant to lay down upon a low level couch and slowly sends her into a hypnotic trance. She closes her eyes and he covers her entire body with a cloth shroud. The girls profile is clearly visible through the shroud. The magician stands to one side of the girls body and with a few mystical passes of his hand her body slowly starts to levitate and rise off the couch. Higher and higher her body is seen to float until her body is clear of the couch. Her body is floated around the stage and around the performer. The shroud then descends back down to the couch and the cover is removed to reveal the girl still asleep until awoke from her floating trance. Alternatively if working in theatre once the girls floating body has cleared the couch, stage curtains may be pulled in front of the couch or the couch taken completely off stage and at the magicians command the floating body under the cloth maybe made to vanish and the girl can reappear at the back of the theatre to the surprise of the audience.